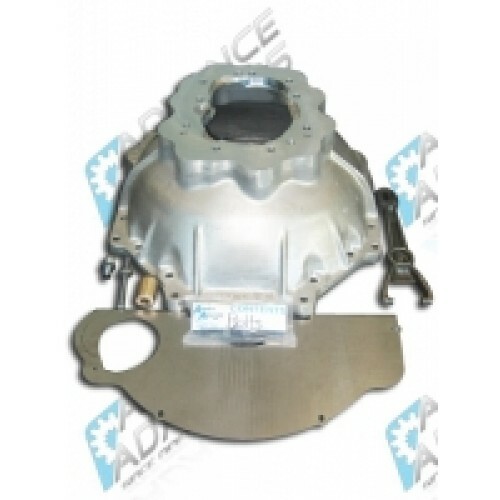 This adapter bellhousing assembly is used to adapt the GM 4.3, 350 to the 1986-95 Toyota Truck 5 speed manual. These transmissions are identified as R150F and R151F The 5 speeds were used in the 4cyl turbo trucks and the 3.0 V6 trucks. The bellhousing kit includes a 356 T-6 aluminum bellhousing, universal dust cover plate, pilot bushing, throw-out arm, slave cylinder push rod, slave cylinder push rod end, ball pivot, fastening hardware, and adapter instructions. Note: When using a 168th flywheel on your GM engine a gear reduction starter is required. We offer gear reduction starters (p/n 22-0001 & 22-0003). Late model 4.3 V6 with an aluminum oil pan must use a 168th flywheel and requires starter 22-0001. Note: This kit is not intended for use with any LS engine. Note: Bellhousing fits Toyota Truck only and is not intended for Supra / Celica car conversions. * 712561V : Toyota Truck R150 & R151F, V6 Manual Transmission to GM 4.3 V6 / 350 Adapter Bell Housing Kit.